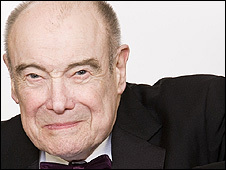 Conductor Vernon Handley has died at the age of 77. Dr Handley, who was honoured with a CBE for his services to music in 2004, passed away at his home in Monmouthshire, Wales, on Wednesday. Roger Wright, controller of BBC Radio 3 and the director of the BBC Proms, said Wednesday's BBC Prom concert would be dedicated to Dr Handley. He said Dr Handley had been a "extraordinary champion of British music" during his 45-year career. Mr Wright told the BBC: "I was sad that Vernon Handley was not able to appear as planned in the Proms this year because of illness and his death today robs us of one of our most distinguished conductors. "Vernon Handley was a wonderful musician and an extraordinary champion of British music. "Audiences owe him a huge debt for his work in bringing the music of British composers of earlier generations to wider attention. "His concerts and recordings of the music of Bax, Elgar and Vaughan Williams in particular were towering achievements. "He will be sorely missed, not least by all those players in the BBC orchestras with whom he worked." Born in London to Welsh parents, Dr Handley recorded more than 150 discs during his distinguished career, with more than 90 featuring the works of British composers. Among his repertoire were the symphonies of Vaughan Williams, Stanford, Malcolm Arnold and Elgar. He was also strong believer in the encouragement of young professional players and was regularly involved with the National Youth Orchestra.